Athletes train. Musicians practice. And when scientists are getting ready for a mission to Mars, they have a field test. When the two Mars Exploration Rovers arrive at the red planet in January 2004, mission scientists will rely on them to make discoveries. 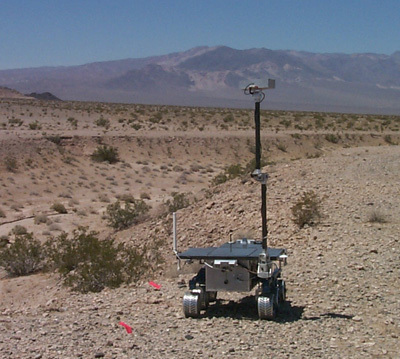 To prepare for intense operations during the mission, NASA's scientists and engineers work with a rover here on Earth called FIDO. Field tests with FIDO allow the team to formulate hypotheses about the geologic environment and use the rover to test them. They practice making decisions quickly and efficiently so they can learn as much as possible about Mars when the Mars Exploration Rovers get there. The pace will be fast. There´s a limited amount of time to look at the data, decide where to go, what to do, and send the next commands to the rovers. The scientists have to determine what they´d like to examine, and the engineers have to decide how...and if...the rover can get there. Everyone involved needs to learn how to work as a team to make quick and sound decisions. Like anything else worth doing, that takes practice, practice, practice. The August 2002 tests went really well. The science team met their mission success criteria, which included going to at least two different locations (other than the landing site) and making extensive measurements, driving 200 meters (656 feet), and digging a soil trench with one of the rover's wheels.